Johnny Rockets is an American diner-themed chain of hamburger restaurants with more than 215 locations worldwide. The company is enriching the dining experience by integrating its digital menu boards and in-restaurant entertainment. To achieve this, Johnny Rockets designed an integrated digital menu board system that not only displays menu items, but also serves as a hub for its in-restaurant entertainment. Wall-mounted displays powered by BrightSign’s XD digital signage media players are placed behind the counter and at other strategic points throughout the restaurant. Some of the displays feature menu items, while others are dedicated to entertainment – namely music content driven by the Rockbot smart music and media platform. The Rockbot platform enables the Johnny Rockets corporate team to create a unique soundtrack for their expansive network of restaurants. Rockbot’s dashboard interface makes it easy for them to choose from hundreds of commercial-free stations with 14 million licensed songs from a diverse range of genres. Content is programmed to change throughout the day to accommodate different crowds and energy levels. At the restaurants themselves, guests then have the option of using their smartphones to select songs from a Johnny Rockets-approved playlist, bringing a level of customization and interactivity that sets Johnny Rockets apart from other restaurants. This installation is unique in that it goes far beyond what is expected of traditional digital signage in a restaurant setting. The system leverages the signage infrastructure to greatly enhance diners’ entertainment with this innovative music-delivery platform. 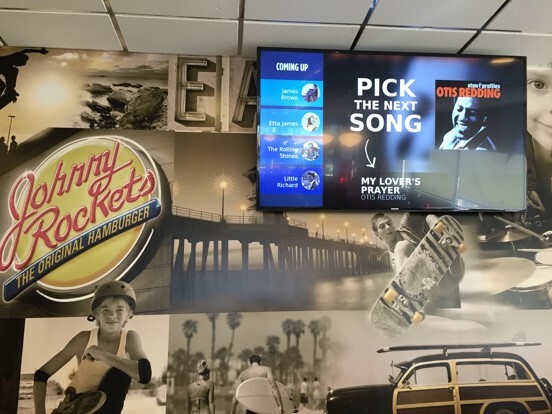 Following a successful pilot roll-out at select US locations, BrightSign-driven digital signage is now the chosen solution for each Johnny Rockets location as they incorporate digital signage into their restaurants. A total of 41 restaurants are now outfitted with the BrightSign/Rockbot solution, with new franchisees being deployed each month.